Thank you for choosing Chudy for over 100 years! Founded in 1913, Chudy Paper Company is the distributor of choice in food service disposables, facility maintenance supplies, janitorial supplies, sustainable solutions and industrial packaging. Servicing Western New York and Northern Pennsylvania with the brands you know and the products you trust. Whether you have locations across the nation or a facility down the street you can be certain you are getting the best service and expertise in the industry. Chudy Paper is your best choice in supply chain management, providing customized, innovative, procurement solutions to help drive efficiencies in today�s leading businesses. Innovation and forward thinking have been the hallmark of Chudy Paper Company since its founding in 1913, with Max Chudy Sr. seeing the value of kraft bags in the place of rolled paper cones for take-out retail applications. With a foothold in the kraft bag business, the company continued expansion in the late 1940's with acquisition of competitors in the Buffalo market as well as Mugler Paper. This expansion provided impetus for the 1950 completion on the Bailey Avenue site, combining with a 1955 expansion to give Chudy Paper over 40,000 sq. ft. central warehouse availability. Growth continued throughout the 1960's and 70's, and acquisition and expansion continued in the late 1970's to meet these growing needs. The tradition carries on with Max Chudy Jr. taking control of the business in 1973 after his father's passing, with the emphasis on customer service remaining the core philosophy of the company. 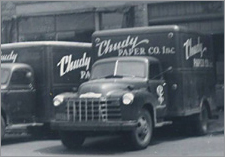 The addition of Rochester Paper Company in 1990 as well as the 2003 warehouse expansion of the central warehouse on Bailey Ave. positioned Chudy Paper as a major force in regional disposables and janitorial distribution with focus on continued growth to meet customer need. Over the years, they have expanded their programs to offer the products and services that make Chudy Paper Company the regional distributor of choice. A new emphasis on janitorial products and solution services beginning in 2000 produced numerous value added offerings for our end user partners. 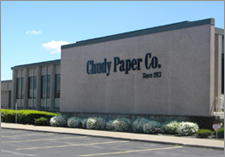 In late 2012 Chudy Paper continued its growth and moved locations to a 100,000 sq. ft. warehouse location on Walden Ave in Cheektowaga, NY. 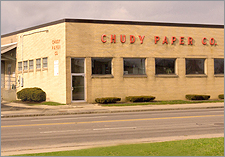 Chudy Paper currently services the Western and Central New York areas as well as New York's Southern Erie and Pennsylvania's Northern Erie regions, with its own fleet of trucks, providing excellent customer service and choice of programs and products for individual customer concern.